The Party (2017) Directed by Sally Potter. Earlier this week, (before the madness of Avengers: Infinity War hit Australia) I was feeling decidedly tired and run down. Recovering from a head cold, too much work and generally worn out, I decided on an evening of solo self-care. What would cheer me up? A hearty dinner for one followed by an acerbic, biting black comedy? Yes please! This film, written and directed by the wonderful Sally Potter (Ginger & Rosa, Yes, The Tango Lesson and the sublime Orlando) was just what I needed. 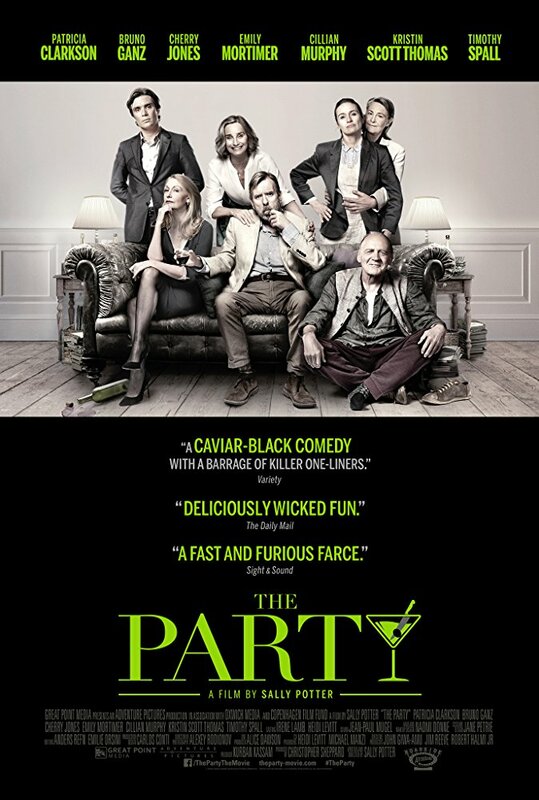 The Party is a short (71 minutes) and fast-paced ensemble piece that revolves around Janet (Kristin Scott Thomas), who’s just been made Minister of Health and is having a few friends around to celebrate her promotion. It was filmed just before the Brexit madness in the UK, proving again that truth is stranger than fiction. Shot in digital black and white and beautifully lit, the focus is often on the faces of the ensemble, accentuating their flaws as much as their beauty. This is particularly true of Cillian Murphy’s often manic Tom and Timothy Spall as Bill (Janet’s taciturn husband). I also think this method showed the underlying dinginess of Bill and Janet’s house (particularly the bathroom), which could also be viewed as a metaphor for their lives. The entire cast of seven are terrific (I’m a sucker for anything with Bruno Ganz in it) but for me Patricia Clarkson as the no filter, cynical and bitter April steals the film and has many of the best lines. There is a twist that I did see coming but I still laughed out loud when it finally arrived. This has opened to mixed reviews and I can see that it does sound and look more like a theatrical production at times, playing with caricatures rather than characters in its short running time. Also note it has a MA15+ rating for some graphic drug use. But nevertheless, I really enjoyed it and would recommend it if you’re a fan of black comedy and farce. It’s currently playing at the State Cinema in North Hobart and selected cinemas across Australia.